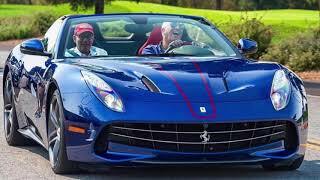 Ferrari has a long history of presenting car lovers across, luxurious, delicate and aggressive cars. 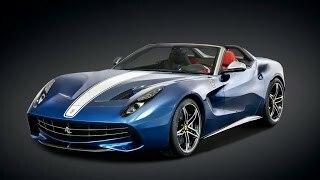 It has since time introduced limited edition models to celebrate with its buyers but this all new, Ferrari F60America 2014 isn’t just a limited version but is an ultra-limited version and it might surprise you but the 10 models which were to be produced got sold prior to official announcement. Let us have a close to look to this F12 Berlinetta engine based model and find out the special features it holds in its interior and exterior. The list of numerous new features in interior of Ferrari F60America 2014 for us began with the leather covered racing bucket seats with thin carbon back, featuring a dual color stripe, running from bottom painted white and top of it in blue. Driver seat is made out of red leather while the passenger seat from black, this distinct addition is to pay homage to Ferrari racing machines from past. Same difference gets carried ahead in the cabin design also. Entire driver side cabin comes in red while the passenger gets black color. While the door panel gets more than half of itself engulfed in red, bottom of steering wheel gets the touch of red but the dashboard and center console are totally dipped into shining red paint. In all we found the interior of Ferrari F60America 2014 a luxurious, comfortable and sporty arena to sit and drive this delicate monster. Exterior of Ferrari F60America 2014 gets an all new designed look, beginning with its front fascia first to knock through your eyes is the slightly more bended nose while the grille resembles to our childhood mate, Cheshire Cat grinning face. Front lip gets air intakes, to pour some fresh air to the brakes. While the hood gets a white stripe running over its blue paint. 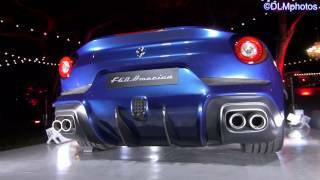 Moving further towards the massively altered rear fascia of Ferrari F60America you’ll find new vents and sculpting in rear bumper. A newly designed rear spoiler brings addition to the touch of sporty looks. Last to be mentioned here in this segment is the light-fabric top and the most important thing to be kept in mind is (you might not like this but we believe it’s ok) moving that roof top only till the speed of 75 mph or you might actually own a limited edition roofless Ferrari. 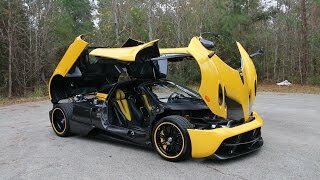 After received numerous changes in its body, the engine inside Ferrari F60America 2014 remains unchanged, we personally don’t consider this bad as performance is all what you need. 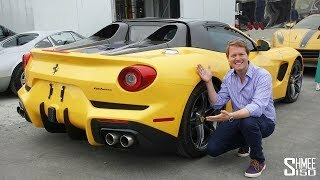 Ferrari F60America gets its power through a 6.3 Liter V12 engine delivering 730 hp and 690 nm torque paired to seven speed dual clutch transmission. The engine with its enthralling power enables the 0-62 mph sprint of Ferrari F60America to be finished in just 3.1 seconds.